Astilbe is a stunning shade perennial grown for both its flowers and foliage. Its fernlike foliage and feathery plumes fit right in with ferns, hostas, and other shade-loving perennials. Astilbe's poofy flowers stand atop erect stalks rising well above the basal leaves that are similar to the seed stalks of some ornamental grasses, but brightly colored. The finely cut foliage is reminiscent of ferns or plants like columbine, but it is glossy and stiff more than soft and smooth. The delicate, yet stout form of the foliage belies the general character of the plant - it fits well with other dainty shade-lovers but is more robust than most, rarely bothered by pests or disease. 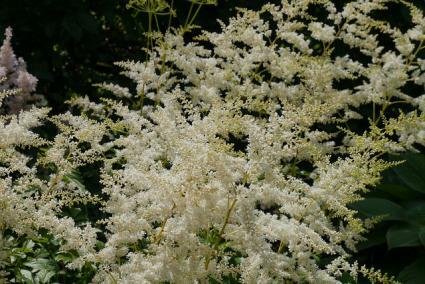 Astilbe spreads via underground rhizomes and can eventually develop into a large patch, though it is not considered invasive. It dies to the ground completely in winter, but the roots are very cold hardy. In general, astilbe excels in cold, moist climates and is more challenging to grow in hot, dry places. The larger varieties work well under large deciduous trees as a backdrop with smaller perennials, while the dwarf kinds can be fit into small perennial, or even annual beds, or planted in pots. Partial sun or filtered light is best. 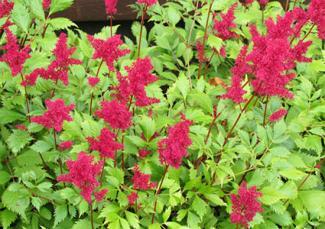 Astilbe tolerates deep shade, where it is useful as a foliage plant, but flowering will be reduced. Full sun is suitable only in the coolest climates. 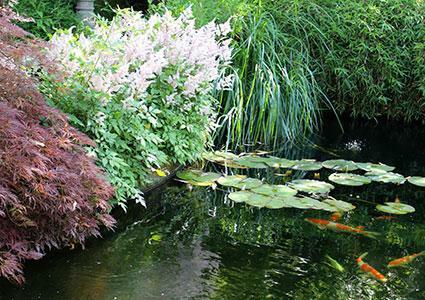 Astilbe demands regular water and is a great choice for use near water features. Plan to water established plants deeply at least once a week in hot dry weather. When freshly planted astilbe may require water on a daily basis. 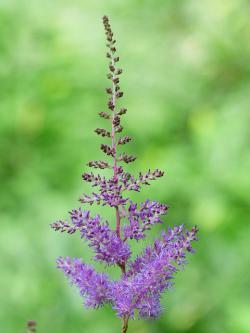 Rich soil is the other key to success with astilbe - it is not a plant for tough conditions. If existing soil conditions are poor, spread several inches of compost over the planting area and work into the soil prior to planting. Astilbe is a long-lived perennial if cared for properly. Mulching is important to retain soil moisture and keep the roots cool, especially in hot climates. It's also helpful to reduce the time spent weeding, one other form of maintenance needed with astilbe. Every few years it's helpful to divide established patches of astilbe to prevent a slow decline in vigor and health. Using a spade, remove 8 to 10 inch clumps of soil and roots in fall or early spring to thin out the patch. These can be potted, planted elsewhere or disposed of if not needed. Otherwise, the only maintenance necessary is to keep astilbe well-watered and to cut the dead stalks to the ground in late fall. Ranging from ankle height to four feet or more and coming in a wide range of colors, there are many varieties to choose from. Fanal blooms in spring and grows one to two feet in height with deep red flowers and bronze foliage. Bridal Veil blooms in summer and grows to three feet with pure white flowers. Pumila is a dwarf form that stays six inches or less and bears fragrant purple flowers. Superba grows to four feet or more with magenta flowers in late summer. By planting different varieties of astilbe, it's possible to enjoy the blooms throughout all of spring and summer. Both the fresh or dried flowers can also be enjoyed indoors in flower arrangements.